Make the most of your Cape Cod romantic getaway by enhancing your reservation with a sweet treat, bouquet of flowers, bottle of wine, or an in-room massage. Browse a sampling of our offerings below, then book your stay directly on our website to add something special to your next reservation! Or, if you’ve already booked your getaway and want to add one of these extras to your reservation, contact us and we can take care of the rest. One of the most popular Cape Cod activities and a definite bucket-list item, whale watch tours run from mid April through late October. You can buy tickets through us when booking your stay, and we’ll have them ready for you when you arrive. Have a bottle of wine and wine glasses waiting for you in your room when you arrive. Surprise your companion with a romantic bottle of chilled champagne in your room upon arrival (or during your stay – just let us know when you would like it served). Surprise your mate with a beautiful floral topiary – hand-arranged by your Innkeeper. The colors, textures and flower types may be customized to suit your occasion or preferences. A Gourmet Cup Cake in your choice of Chocolate, Vanilla or Lemon Cake. Your choice of Chocolate, Yellow, or Lemon Cake. Serves 8-10 people. Fully abandon the stresses you left behind and pamper yourself with an in-room massage during your stay. We will arrange for a licensed massage therapist to come to your guest room for a quiet singles massage. Fully abandon the stresses you left behind and pamper yourself with an in-room massage during your stay. We will arrange for two licensed massage therapists to come to your guest room for a couples massage for you and your mate. 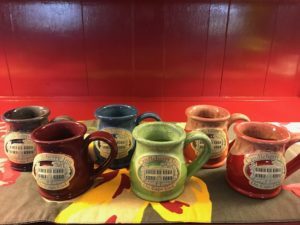 Enjoy your favorite beverage in one of these handmade clay mugs. Available colors are plum, burgundy, blue, green, coral or orange-red. Safe for dishwasher, oven, microwave or freezer. Let us know your preferred color when you arrive. This handmade 3 oz. clay mini pitcher with handle is perfect for cream, syrup, gravy or even a small bud vase. Available in green. Safe for dishwasher, oven, microwave or freezer. This handmade 6 oz. clay pitcher is perfect for cream, syrup, gravy or even a small bud vase. Available in blue. Safe for dishwasher, oven, microwave or freezer. Have you already booked your vacation and want to add one of these extras to your reservation? Simply contact us and we can take care of the rest!